Don't Be A Victim. Safety Saves Lives. 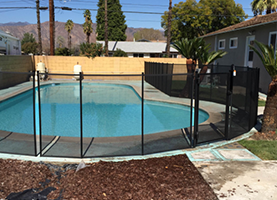 Nathan's Pool Fences is the Brea source for customized pool safety nets and solid pool covers. 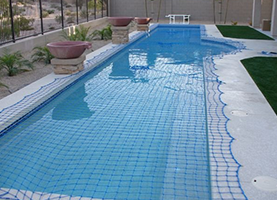 Pools are a wonderful addition to your property and are practically a necessity in Brea, CA. They provide fun, exercise, and a place for a cool, relaxing dip when the heat gets overwhelming. However, pools also can be dangerous and should be safeguarded to prevent accidental drowning. At Nathan's Pool Fences, we are all about pool safety. We offer our area neighbors several ways to ensure the safety of their pools, specializing in our removable pool fence system, including all safe pool fence, baby pool fence, safety pool fence, and guarding pool fence. Our prices on all our systems are reliably affordable and are the lowest in town. Pool fences are a required safety measure, but permanent fencing is expensive and may not meet your landscaping needs. With a removable fence from Nathan's Pool Fences, you can determine the size of the enclosure and fit the fence to suit your needs, even when those needs change. 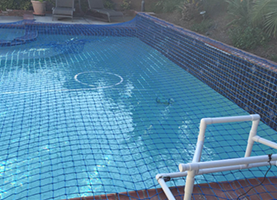 •	Pool Safety Nets—These provide a blanket of polyethylene rope squares that are sized to prevent even the smallest infant from falling into the pool unheard or unseen. •	Pool Safety Covers—These standard and customized pool covers will protect your pets and family as well as your pool by covering it to prevent accidents and the collection of unwanted debris. Our staff members are expert specialists in pool safety and can meet with you to determine the best system for your needs. We can help you customize your pool cover or determine the size of a removable fence that will completely enclose the pool or will surround the pool area. Serving Brea and all surrounding areas.